School 12 My Brother’s Keeper students with mentors and Detective Millington. 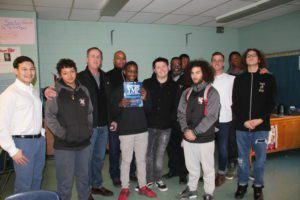 Students in the My Brother’s Keeper program at School 12 recently met with guest mentor Troy Police Detective Mark Millington to learn the proper way to interact with police officers if approached. He also discussed ways to stay out of trouble; the most obvious being simply not doing things that are illegal, but also being critical in choosing your friends. My Brother’s Keeper is a mentor program established in 2014 under the Obama administration. It is focused on eliminating opportunity gaps faced by disadvantaged youth, particularly young boys of color. Troy’s Alternative Learning Program at School 12 was awarded a 3-year grant to operate the program after school. Students are mentored by teachers, and earn the privilege of attending field trips for positive behavior, including trips to athletic games, movies and more. Recently, students took a tour of Hudson Valley Community College, giving them a sense of what it’s like to be on a college campus. “Going to Hudson Valley [Community College] definitely got me thinking that [college] is something I might like to do,” said Omarion Skipworth, 8th Grade student. Detective Millington speaks to School 12 students about interacting with police officers. The program follows a curriculum laid out in the book, Young Men of Purpose, written by Roy Dobbs. In it, he focuses on three elements: character, citizenship and academics. Recently, Mr. Dobbs visited the program, something Omarion found to be inspirational because they shared similar life experiences. According to the program coordinator, Dr. Kenneth Newman, the goal of the program is to reduce the number of suspensions and to further help students graduate college, career and citizen ready. 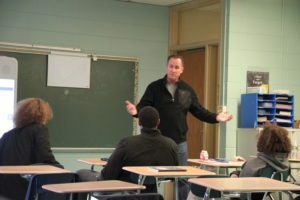 Currently, 99 percent of the students are passing all four subjects and are taking the lessons they’ve learned back to the classroom with them. As for Omarion, the program seems to be working.